This is an advertisement for Hudson's soap. The fight against dirt and grim in the 19th century was a long and hard fought battle. ‘Cleanliness was next to Godliness’ for the Victorians and consumption of soap increased dramatically after the abolition of the soap tax in 1853. Until the 1880s soap had been manufactured locally by chemists, then Lever’s introduced branded soaps like ‘Hudson’s extract’, and sold them across the county. 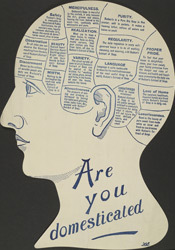 This advert uses the ‘science’ of Phrenology, )using the bumps and shape of the head to determine character), which was popular at the time, to promote the use of soap.